Noninvasive ventilation (NIV) refers to the administration of ventilatory support without using an invasive artificial airway (endotracheal tube or tracheostomy tube). The use of noninvasive ventilation (see the video below) has markedly increased over the past two decades, and noninvasive ventilation has now become an integral tool in the management of both acute and chronic respiratory failure, in both the home setting and in the critical care unit. Noninvasive ventilation has been used as a replacement for invasive ventilation, and its flexibility also allows it to be a valuable complement in patient management. Its use in acute respiratory failure is well accepted and widespread. It is the focus of this review. The role of noninvasive ventilation in those with chronic respiratory failure is not as clear and remains to be defined. Noninvasive ventilation. Courtesy of Therese Canares, MD, and Jonathan Valente, MD, Rhode Island Hospital, The Warren Alpert Medical School of Brown University. An interest in the methods of artificial respiration has long persisted, stimulated by attempts at resuscitation of drowning victims. Reports dating from the mid 1700s document a bellows-type device being the most commonly used form of respiratory assistance. Negative-pressure tank-type ventilators came into use in the next century, with a prototype developed by Dalziel in 1832. This spawned a variety of cuirass and tank negative-pressure ventilators, with the general principle of enclosing the thorax, creating negative pressure to passively expand the chest wall and lungs. This led to the Drinker-Shaw iron lung in 1928, which was the first widely used negative-pressure ventilator. In 1931, Emerson modified these large devices, and the Emerson tank ventilator became the standard for ventilatory support. The Emerson tank ventilator was especially crucial in the treatment of poliomyelitis victims. Rudimentary devices that provided continuous positive airway pressure were described in the 1930s, but the negative-pressure ventilators were the predominant method of ventilatory support until the polio epidemics overwhelmed their capacity in the 1950s. Development of positive-pressure valves delivered through tracheostomy tubes permitted the delivery of intermittent positive pressure during inspiration. This quickly replaced the negative-pressure ventilators, further supported by the development of the cuffed endotracheal tube and bedside ventilators. However, positive-pressure ventilation delivered through either a translaryngeal endotracheal tube or a tracheostomy tube was also associated with a host of complications, specifically injury to the larynx and trachea, as well as other issues involving the timing of extubation, preservation of speech, and the ability to continue swallowing. 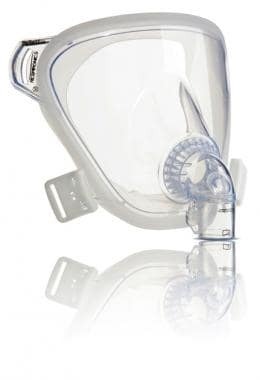 In the 1980s, increasing experience with positive-pressure ventilation delivered through a mask in patients with obstructive sleep apnea led to this type of ventilatory support, initially in patients with neuromuscular respiratory failure. Success led to its adoption in other conditions, and noninvasive ventilation became especially promising in the treatment of patients with decompensated chronic obstructive pulmonary disease. In the ensuing 20 years, noninvasive positive-pressure ventilation delivered via a mask has been widely adopted, to the point where it is a first-line therapy in some medical centers. The conditions and patients best suited for noninvasive ventilation are discussed. Patient with decompensated congestive heart failure undergoing noninvasive ventilatory support with BiPAP ventilation and an orofacial mask. Patient with an exacerbation of chronic obstructive pulmonary disease (COPD) undergoing treatment with noninvasive ventilation using an orofacial mask. Positive-pressure ventilation delivered through a mask has become the predominant method of providing noninvasive ventilatory support and is the focus of this and subsequent sections. Early bedside physiologic studies in healthy patients and in patients with respiratory conditions document successful ventilatory support (ie, reduction in respiratory rate, increase in tidal volume, decrease in dyspnea) with reduction in diaphragmatic electromyography (EMG), transdiaphragmatic pressures, work of breathing and improvement in oxygenation with a reduction in hypercapnia. 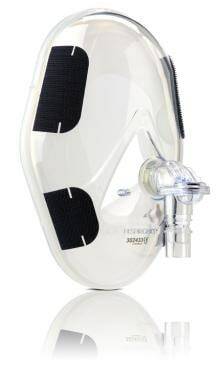 Ventilatory support can be achieved through a variety of interfaces (mouth piece or nasal, face, or helmet mask), using a variety of ventilatory modes (eg, volume ventilation, pressure support, bilevel positive airway pressure [BiPAP; see the image below], proportional-assist ventilation [PAV], continuous positive airway pressure [CPAP]) with either ventilators dedicated to noninvasive ventilation (NIV) or those capable of providing support through an endotracheal tube or mask. 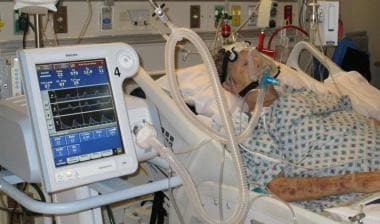 Older models of noninvasive ventilators required oxygen to be bled into the system, but current models incorporate oxygen blenders for precise delivery of the fraction of inspired oxygen (FIO2). 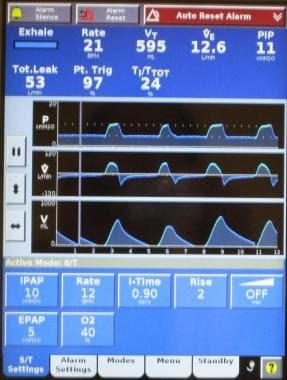 Screen shot of ventilator graphics and information panel of a patient undergoing BiPAP ventilation. Negative-pressure ventilators provide ventilatory support using a device that encases the thoracic cage starting from the neck, and devices range from a whole-body tank to a cuirass shell. The general principal is the same with a vacuum device, which lowers the pressure surrounding the thorax, creating subatmospheric pressure and thereby passively expanding the chest wall with diaphragmatic descent, all leading to lung inflation. Exhalation occurs with passive recoil of the chest wall. This was the predominant technology during the polio epidemics, but these devices were bulky and cumbersome to use. Upper airway obstruction was also a problem. These ventilators have been largely supplanted by the more widespread positive-pressure noninvasive ventilators; however, some patients continue to be treated with this modality. While the bulk of the experience lies in patients with chronic respiratory failure, specifically neuromuscular respiratory failure, reports described successful application in patients with acute respiratory failure. As a result of prospective, randomized clinical trials, another option has emerged for the patient with hypoxemic respiratory failure. Heated, humidified, high-flow nasal cannula oxygen has been available for over a decade, but refinements and increasing clinical experience have made it a solid alternative for management that exists in the spectrum of options before noninvasive and invasive mechanical ventilation. This modality was initially developed for neonatal patients, and refinements have permitted its use in adults. Conventional oxygen therapy is not well tolerated at high flow rates because of problems with unheated and nonhumidified oxygen. The high-flow nasal cannula oxygen systems are able to heat and humidify, improving patient tolerance and comfort. The high flow rates have other advantages in that high flow rates minimize room air entrainment, thereby increasing the FIO2 that can be provided to patients; are able to wash out dead space carbon dioxide, improving the efficiency of oxygen delivery; and the increased flow rate translates into positive end-expiratory pressure (PEEP). The amount of PEEP provided is a function of the flow rate but falls somewhere in the range of 0.35-0.69 cm water for each 10 L/min of increased flow rate. Therefore, while high-flow nasal cannula devices technically do not provide assisted support or augment inspired tidal volume as provided by the other forms of mechanical ventilation, the small amount of positive pressure provided does help reduce the work of breathing and improve breathing patterns similarly to that achieved with CPAP. An intact respiratory drive is required with this modality, which means that it is not suited for patients with hypoventilation or a blunted respiratory drive. It is reasonable to consider this modality as another method of providing low-level CPAP, which at its most rudimentary level, is a form of noninvasive ventilation. The focus of this review is on noninvasive ventilation provided through a mask-ventilator interface, but it is important to recognize that the option of high-flow nasal cannula oxygen exists and may be a viable option for some patients. It seems especially suited to the recently extubated, postoperative patient and those with mild-to-moderate hypoxemic respiratory failure as may occur in patients with decompensated heart failure. There may be efficacy in other conditions, but experience is limited. Additional comments have been included to highlight additional clinical features unique to high-flow nasal cannula oxygen. The key to the successful application of noninvasive ventilation is in recognizing its capabilities and limitations. This also requires identification of the appropriate patient for the application of noninvasive ventilation (NIV). Patient selection is crucial for the successful application of noninvasive ventilation. Once patients who require immediate intubation are eliminated, a careful assessment of the patient and his or her condition determines if the patient is a candidate for noninvasive ventilation. This requires evaluation on several levels, and it may involve a trial of noninvasive ventilation. The following variables and factors help identify patients who may be candidates for noninvasive positive-pressure ventilation. After eliminating unsuitable candidates for noninvasive ventilation, successful application of noninvasive ventilation mandates close assessment and selection of patients and identification of conditions best suited for treatment. Not all patients with diagnoses capable of management with noninvasive ventilation (eg, chronic obstructive pulmonary disease [COPD]) are suitable candidates for treatment with noninvasive ventilation. Patients with mild disease or very severe distress may not benefit from noninvasive ventilation, which is best suited for patients with a moderate severity of illness. Not all respiratory conditions are suitable for treatment with noninvasive ventilation. Conditions that have garnered the most experience and success are generally conditions that also respond relatively quickly to treatment, for which noninvasive ventilation provides an important adjunctive support to other simultaneously administered therapeutics. These are listed below and are discussed in subsequent sections. Be aware that the list and indications continues to change as more experience is accumulated in these and newer conditions. Several considerations can enhance the likelihood of successful noninvasive ventilation (NIV). In addition to these factors, the experience and expertise of front-line health care providers, specifically nursing and respiratory therapy staff, cannot be underestimated. This is not a concern in hospitals where noninvasive ventilation is well established, but it is an important factor in facilities where noninvasive ventilation has been infrequently administered or not used at all. It can be used in the ICU, especially if there is the possibility of intubation. In its simplest terms, noninvasive ventilation differs from invasive ventilation by the interface between the patient and the ventilator. Invasive ventilatory support is provided via either an endotracheal tube or tracheostomy tube. Noninvasive ventilatory support uses a variety of interfaces, and these have continued to evolve with modifications based on patient comfort and efficacy. Many of the interfaces or masks were initially used in patients with obstructive sleep apnea before they were adapted for use in patients to provide noninvasive ventilatory support. Nasal masks and orofacial masks were the earliest interfaces, with subsequent development and use of full face masks, mouthpieces, nasal pillows, and helmets. Nasal masks and orofacial masks are still the most commonly used interfaces. Orofacial masks are used almost twice as frequently as nasal masks. Both have advantages and disadvantages in the application of noninvasive ventilation. Nasal mask. Courtesy of Philips Healthcare (previously Respironics). Full face mask. Courtesy of Philips Healthcare (previously Respironics). Total face mask. Courtesy of Philips Healthcare (previously Respironics). Helmet mask. Courtesy of Harol S. R. L.
Proper fitting of the mask or other interface is another key component to successful noninvasive ventilation. The mask or interface may be held in place (without straps applied) by the patient or therapist to familiarize the patient with the mask and ventilator. Typically, the smallest mask providing a proper fit is the most effective. Straps hold the mask in place, with care to minimize excess pressure on the face or nose. Leaks are the bane of all of the interfaces, but excess pressure applied with the straps increases the risk of pressure necrosis and skin breakdown. Straps should be tight enough to prevent leaks, but with enough slack to allow passage of one or two fingers between the face and the straps. The nasal and orofacial masks may be first-line and second-line options, specifically in patients who may have prior familiarity with these interfaces or in those who may have had difficulty with orofacial or nasal masks. Clinical trials have not demonstrated the superiority of any interface, although the nasal mask may be more effective in patients with a lower severity of illness. In patients with a higher severity of illness, the orofacial mask and total face mask appear to result in comparable outcomes. The main considerations regarding the choice of an orofacial mask or nasal mask are outlined below. While orofacial masks and nasal masks are the most commonly used interfaces, other patient ventilator interfaces through which noninvasive ventilation can be applied include mouthpieces, nasal pillows, total face masks, and even a helmet device, which encompasses the entire head. Experience with helmet devices is limited but increasing, and it has been successful in patients who are unable to tolerate the nasal or orofacial devices. The choice of ventilators available to provide noninvasive ventilatory support has continued to expand. Early noninvasive ventilatory support was applied using either large bedside critical care volume ventilators or smaller volume or pressure specialty ventilators devoted to noninvasive ventilation. While the critical care ventilators had more options, they were also less tolerant of leaks. The specialty ventilators had fewer options and range, but they were more leak tolerant. Many critical care ventilators currently in use also have a noninvasive ventilation option, either as part of the original device or available as an upgrade option. The ideal device is dependent on a number of factors, including familiarity by staff and available options. The differences between the bedside critical care ventilator and specialty noninvasive ventilator continue to diminish as differences related to ventilator options, range of support, and leak tolerance are corrected in both devices. The distinction in function and capability has blurred, and there are devices that are capable of providing both invasive and noninvasive ventilation with a mere switch of ventilator settings. Nevertheless, most hospitals continue to provide noninvasive support with the specialty ventilator. Choosing the initial mode of ventilation is based in part on past experience, in part on the capability of ventilators available to provide support, and in part on the condition being treated. Most patients who are provided noninvasive ventilation are provided support with pressure ventilation, with continuous positive airway pressure (CPAP), which is the most basic level of support. CPAP may be especially useful in patients with congestive heart failure or obstructive sleep apnea. Bilevel positive airway pressure (BiPAP) is probably the most common mode noninvasive positive pressure ventilation and requires provisions for inspiratory positive airway pressure (IPAP) and expiratory positive airway pressure (EPAP). The difference between IPAP and EPAP is a reflection of the amount of pressure support ventilation provided to the patient, and EPAP is synonymous with positive end-expiratory pressure (PEEP). Some noninvasive ventilation is provided using proportional-assist ventilation (PAV), which provides flow and volume assistance with each breath. Clinical trials have not demonstrated a significant difference between PAV and pressure-support ventilation with BiPAP. [5, 6] However, BiPAP is the most commonly available and more frequently used modality for noninvasive ventilation. PAV remains available on many ventilator models, but use is much less common than BiPAP. While volume ventilators can be used to provide noninvasive ventilatory support, the previously described modes are preferred because they provide better patient comfort and synchrony and are more tolerant of the leaks that accompany all noninvasive ventilatory interfaces. Adequate ventilation and oxygenation, correction of respiratory failure, and adequate patient tolerance and comfort are the primary goals of noninvasive ventilation, and adjustments are made to achieve these endpoints. Initial settings focus on achieving adequate tidal volumes, usually in the range of 5-7 mL/kg. Additional support is provided to reduce the respiratory rate to less than 25 breaths/minute. Oxygen is adjusted to achieve adequate oxygenation, with a pulse oximetry goal of greater than 90%. Serial arterial blood gas measurements are essential to monitor the response to therapy and to guide further adjustments in the ventilator. The following provides some guidance on titration of ventilator settings in patients with respiratory distress and who have never been placed on noninvasive ventilation. In those patient who may have chronic noninvasive support, the initial values should be based on prior support levels. The listed levels may be inadequate and would thus increase the likelihood of intolerance or failure. If there is uncertainty, it is important to perform a bedside titration with increasing levels based on patient comfort or exhaled tidal volumes. These adjustments can be made within minutes and can be done without obtaining blood gases. The above considerations and approach to adjustment are best suited for those with COPD or chronic heart failure as the primary cause of their hypercapnia or hypoxemic respiratory distress and failure. Patients with neuromuscular disorders (amyotrophic lateral sclerosis, postpolio syndrome, muscular dystrophy) or thoracic cage disorders (severe kyphoscoliosis) may fare better with other ventilatory modalities. The most current noninvasive ventilators have PC or average AVAPS options. In PC ventilation, both the inspiratory pressure and the inspiratory time are set and fixed. This differs from BiPAP in which the patient controls the inspiratory time. This modality may be useful in the neuromuscular disease patient who does not have the respiratory muscle strength to generate an adequate inspiratory time. Setting an increased inspiratory time may increase the tidal volume provided, but it may also increase patient-ventilator dyssynchrony if the set inspiratory time is longer than the patient's desired inspiratory time. As with any pressure-cycled mode, the dependent variable is volume and it may vary widely if there is patient dyssynchrony, changes in lung compliance, or changes in resistance that can occur with changes in body position that occurs in the very morbidly obese. A fixed pressure support setting will not compensate for these changes, and, as a result, delivered tidal volume will fall. AVAPS allows a target tidal volume to be identified with a range of pressure support settings that fluctuate to meet the target tidal volume. AVAPS uses an internal algorithm to make changes in the pressure support supplied to achieve the target volume, but these changes are small and occur over minutes (typically 1-2.5 cm water per minute). That is why rapidly changing, acute respiratory conditions are not suited for AVAPS as the ventilator adjustments may not be timely enough to meet the patient's requirements. Typically, the pressure support required to produce the target volume during bedside titration is used to identify the minimal pressure with the set minimal pressure (min P), typically 2-3 cm water lower to allow flexibility for adjustment in the AVAPS mode. The maximal pressure (max P) is typically set in the 20-25 cm water range as higher pressures are not well tolerated. The min P is at least 8 cm water and usually higher. Additional parameters that are part of AVAPS setting are the target tidal volume, respiratory rate, EPAP, and inspiratory time. Importantly, recognize that certain parameters may predict successful noninvasive ventilation or failure of noninvasive ventilation, so that patients are not subjected to continued treatment when optimal treatment requires intubation and mechanical ventilation. This includes changes during a trial of noninvasive ventilation. The changes, in turn, are a reflection of the patient's ability to cooperate with noninvasive ventilation, patient-ventilatory synchrony, and noninvasive ventilation effectiveness. Trials of noninvasive ventilation are usually 1-2 hours in length and are useful to determine if a patient can be treated with noninvasive ventilation. Extended trials without significant improvement are not recommended because this only delays intubation and mechanical ventilation (unless patients are do-not-intubate status). Certain patients may benefit from a trial of therapy; however, limiting trials is important to avoid delays in definitive therapy. Trials may be as short as a few minutes, in patients with immediate failure, and probably should not exceed 2 hours if patients fail to improve. Objective criteria for discontinuation are important to limit trials in patients in whom noninvasive ventilation ultimately fails. This specifically refers to intubation criteria, which carry a subjective element but have been defined in the literature in investigational studies. All these criteria are subject to some degree of interpretation in the context of the patient's clinical status. Importantly, recognize the following as guidelines to assist with the decision to intubate a patient. Most patients who meet these criteria are candidates for intubation, but a few may be able to be managed with continued noninvasive ventilation. Patients with underlying chronic obstructive pulmonary disease (COPD) who present with an exacerbation of their COPD and hypercapnic respiratory distress or respiratory failure are the group most likely to be successfully treated with noninvasive ventilation (NIV). Exacerbations increase the work of breathing in these patients and may exceed the patient's ability to adequately ventilate through a variety of mechanisms, including increasing hyperinflation with decreased diaphragmatic excursion and strength, increasing intrinsic positive end-expiratory pressure (PEEP), ineffective or inadequate tidal volume generation, respiratory patterns, and increased respiratory frequency. Noninvasive ventilation effectively unloads the respiratory muscles, increasing tidal volume, decreasing the respiratory rate, and decreasing the diaphragmatic work of breathing, which translates to an improvement in oxygenation, a reduction in hypercapnia, and an improvement in dyspnea. Noninvasive ventilation is an important adjunct to other conventional therapy (eg, bronchodilators, corticosteroids, antibiotics). COPD is an ideal condition for noninvasive ventilation, given the rapid reversibility with treatment and added support that can be provided by noninvasive ventilation. Most experience with noninvasive ventilation has accrued with either bilevel positive airway pressure (BiPAP) or pressure support ventilation, less so with volume ventilation and continuous positive airway pressure (CPAP), which is infrequently used as a mode of ventilatory support in these patients. While prospective randomized trials have involved relatively small numbers of patients (< 1000 total), a consistent treatment benefit has been demonstrated, and noninvasive ventilation has been recommended as first-line therapy in the management in COPD patients with hypercapnic respiratory failure. Systematic reviews and meta-analyses have all come to the same conclusion. Noninvasive ventilation reduces the need for intubation, mortality, complications, and length of stay in patients with COPD. However, the magnitude of the benefit of noninvasive ventilation differs given some inconsistencies in the included studies. The largest review concluded that noninvasive ventilation decreased the intubation rate by 28% (95% confidence interval [CI], 15-40%), in-hospital mortality rate by 10% (95% CI, 5-15%), and absolute reduction in length of stay by 4.57 days (95% CI, 2.30-6.38 d). The benefit was most pronounced in patients with more severe COPD exacerbations, defined by an initial pH of less than 7.30. The magnitude of effect was even more pronounced in this group, with intubation rates decreased by 34% (95% CI, 22-46%), mortality reduction of 12% (95% CI, 6-18%), and absolute reduction in the length of stay by 5.59 days (95% CI, 3.66-7.52 d). Investigations with less severely affected patients did not demonstrate any benefit in any of these outcomes. Additional experience with noninvasive ventilation in hypercapnic COPD has helped to identify possible thresholds for its application. Severely hypercapnic patients with severe respiratory acidosis and lethargy or even frank coma related to the hypercapnia were often excluded from trials of noninvasive ventilation because of concerns for progressive respiratory failure and an inability to cooperate with noninvasive ventilation as a result of their carbon dioxide narcosis. In some centers, patients with an initial pH of less than 7.25 and a Glasgow Coma Scale score of less than 11 had noninvasive ventilation failure rates of 70% or greater. Some report successful application of noninvasive ventilation in patients with a Glasgow Coma Scale score less than 8 and an average pH of 7.13 ± 0.06 (mean ± standard deviation), with 76 (80%) of 95 patients responding to treatment with noninvasive ventilation. Others have had less success, grading sensorium using a Kelly score of 4 or more defined as a stuporous patient, only intermittently able to follow commands, and an average pH of 7.22, where the success rate was 55% in a group of 20 patients. However, in all of these series, improvement after 1-2 hours noninvasive ventilation was predictive of success. Local experience and expertise also play significant roles in determining the successful limits of noninvasive ventilation in COPD patients. Patients who are not cooperative and have a pH that approaches 7.20 must be evaluated with caution because they have a higher risk of failure with noninvasive ventilation and would therefore benefit from earlier intubation (if an option), especially if they do not respond to a short trial of noninvasive ventilation. The case for first-line use of noninvasive ventilation in the management of acute exacerbations of COPD has been further supported by review of large administrative databases. [19, 20] Noninvasive ventilation has better outcomes than invasive mechanical ventilation when used as the initial treatment in those with acute exacerbations of COPD on several levels, including length of stay, hospital-acquired pneumonia, and mortality. However, those in whom noninvasive ventilation fails and who require intubation have a worse outcome, about three times higher than those initially treated with noninvasive ventilation. However, successfully treated patients do not have the same severity of illness as those who are initially subject to intubation and mechanical ventilation, and those in whom noninvasive ventilation fails likely represent a group whose worse outcomes are further testaments to their borderline status. This further emphasizes the importance of proper patient selection for noninvasive ventilation, with the best-suited patients identified from the clinical trials summarized below. COPD is the most suitable condition for noninvasive ventilation. Hypercapnic respiratory acidosis may define the best responders (pH 7.20-7.30). Noninvasive ventilation is also effective in patients with a pH of 7.35-7.30, but no added benefit is appreciated if the pH is greater than 7.35. The lowest threshold of effectiveness is unknown, but success has been achieved with pH values as low as 7.10. Obtunded COPD patients can be treated, but the success rate is lower. Improvement after a 1- to 2-hour trial may predict success. Respiratory insufficiency due to cardiogenic pulmonary edema or congestive heart failure (CHF) is another condition that is effectively treated with noninvasive ventilation (NIV). Respiratory failure due to heart failure is potentially a rapidly reversible condition, similar in its reversibility to decompensated chronic obstructive pulmonary disease (COPD), and noninvasive ventilation is an ideal adjunct to the other treatments used in the management of CHF. The pathophysiology of respiratory failure in CHF is related to a combination of pulmonary vascular congestion, interstitial edema, and alveolar fluid accumulation. This leads initially to hypoxemic respiratory failure, and patients with CHF who further deteriorate manifest hypercapnic respiratory failure. Positive-pressure ventilation is beneficial because it recruits alveoli, increases functional residual capacity, and allows breathing on the more compliant portion of the lung's pressure-volume curve, thereby decreasing the work of breathing, improving ventilation-perfusion relationships, and eventually correcting hypoxemia and hypercapnia. Positive intrathoracic pressure also decreases preload and left ventricular afterload, both beneficial effects in patients with intravascular volume overload. These beneficial effects can be achieved with continuous positive airway pressure (CPAP), which has been recommended as a first-line therapy in CHF patients. The other ventilator modalities, such as bilevel positive airway pressure (BiPAP), pressure support ventilation, or volume ventilation, have also been used and some controversy exists regarding their efficacy when compared with CPAP. Note that CPAP has long been recognized as effective in the management of CHF, with initial reports dating from as early as 1938 using very simple pressure devices. Randomized prospective trials comparing its efficacy with oxygen were not conducted for almost 50 years, and small trials also confirmed its effectiveness in correcting gas exchange abnormalities, even in patients with profound respiratory acidosis, with a general benefit of both a reduction in intubation rates and mortality rates. The largest randomized trial comparing oxygen, CPAP, and noninvasive ventilation as adjunctive treatments to conventional therapy in patients with CHF did not identify any intubation or mortality benefit. Patients with CPAP and noninvasive ventilation (BiPAP) did have more rapid resolution of symptoms and correction of gas exchange abnormalities and pH compared with the oxygen group. No difference was noted between CPAP and noninvasive ventilation (BiPAP). Do note, however, that this trial randomized and treated patients in an emergency department setting, and treatment with noninvasive ventilation averaged approximately 2 hours. Admission to a critical care unit was an outcome measure, and the overall intubation rate for all of the groups was less than 3%. This is distinctly different from other trials, in which the intubation rates for the control groups were approximately 31%. This raises some question about the comparability of these three groups of patients with patients reported in other trials, which included patients requiring ICU-level care. Noninvasive ventilation is effective in patients with CHF. CPAP is probably the most effective mode, achieving a reduction in intubation rates and mortality rates, with a little less effectiveness noted with noninvasive ventilation (BiPAP). Subsequent experience with BiPAP has not identified an increased risk with therapy, specifically no increased risk of myocardial infarction; therefore, the choice of ventilatory support may be a local or patient-based decision. Subsequent trials comparing BiPAP or its equivalent with CPAP have failed to demonstrate the superiority in patient outcomes of one mode to the other. Patients with CHF who can be treated in an emergency department setting may only realize a symptom or dyspnea benefit from noninvasive ventilation (whether CPAP or BiPAP) as opposed to oxygen alone. Noninvasive ventilation is well suited for patients with cardiogenic pulmonary edema. CPAP and BiPAP modalities both are effective, with CPAP possibly being more effective. The greatest benefits are realized in relief of symptoms and dyspnea. A decrease in intubation and mortality rates is not a universal experience. Patients with hypercapnic respiratory acidosis may derive the greatest benefit from noninvasive ventilation. Importantly, adjust to standard therapy, including diuresis. Benefit may be seen with as few as 2 hours of support. Interest in the use of noninvasive ventilation (NIV) after discontinuation of mechanical ventilation is considerable. Postextubation respiratory insufficiency requiring reintubation can occur in more than 20% of patients. Many of the pathophysiologic derangements discussed in earlier sections also occur in the postextubation period, including increased respiratory load, hyperinflation, diaphragmatic dysfunction, and increases in preload and afterload, all of which can contribute singly or in unison to hypercapnia, hypoxemia, and eventual respiratory failure. In addition, patients may have incurred some upper airway trauma with intubation or may have developed upper airway edema, which, in turn, can contribute to partial upper airway obstruction, which is another factor contributing to an increased respiratory workload. Noninvasive ventilation can ameliorate some of the pathophysiologic derangements that occur following extubation and has been used in 2 primary postextubation scenarios. Patients in whom weaning trials have failed or those who do not meet extubation criteria have been extubated to noninvasive ventilation support as part of an early extubation approach or as an adjunct to weaning. Early extubation with noninvasive ventilation support may be able to prevent some of the complications associated with endotracheal intubation, specifically nosocomial pneumonia. In addition, noninvasive ventilation allows for speech with preservation of oropharyngeal function. Noninvasive ventilation has also been applied to patients who were identified as candidates for extubation based on weaning and/or extubation criteria but then developed postextubation respiratory distress. While mixed groups of patients are encountered, the vast majority of patients managed with postextubation noninvasive ventilation support have had underlying chronic obstructive pulmonary disease (COPD), and this is the population that seems especially suited to noninvasive ventilation in general and, specifically, to noninvasive ventilation–supported weaning. High-flow nasal cannula oxygen may have a role in this setting, probably better than face mask oxygen. Its potential benefit may lie in its ability to provide higher levels of oxygen and a small amount of positive pressure compared with standard oxygen therapy. However, its performance and role compared with noninvasive ventilation remains under investigation. In summary, experience to date suggests that noninvasive ventilation can help facilitate weaning and discontinuation of mechanical ventilation in selected patients. Patients with underlying COPD are the best candidates, but other groups may also benefit from an early-extubation approach followed by noninvasive ventilation support. 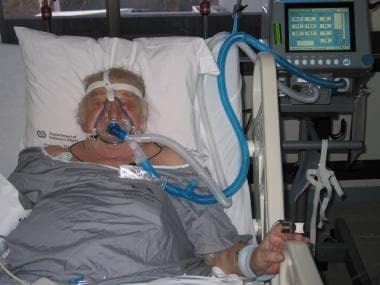 COPD patients who develop respiratory distress after meeting criteria for extubation are most likely to benefit from noninvasive ventilation, but this is not established and use of noninvasive ventilation in these patients (as well as any other patient who develops postextubation respiratory distress) should be done with caution. Noninvasive ventilation is effective as a bridge support after early extubation. Noninvasive ventilation is an adjunct to weaning (substitutes noninvasive support for invasive support). Patients with underlying COPD are most likely to benefit from noninvasive ventilation after early extubation. Noninvasive ventilation is not as effective in patients with postextubation respiratory distress. COPD patients are a subgroup who may benefit in that situation. Noninvasive ventilation (NIV) has been used in a number of clinical situations, but it seems to be most effective in patients with acute respiratory failure due to underlying chronic obstructive pulmonary disease (COPD) or congestive heart failure (CHF). These represent the hypercapnic and hypoxemic conditions best suited for noninvasive ventilation, but, obviously, other conditions can also be treated with noninvasive ventilation. Noninvasive ventilation (NIV) has a very different profile of complications compared with complications associated with endotracheal intubation and mechanical ventilation. This is directly attributable to the elimination of the endotracheal tube in patient management. Complications associated with its placement, the duration of placement, and removal of the tube all are averted. In addition, patients are usually not sedated as they would be if they were intubated, which further reduces complications related to sedation. Even complications common to both noninvasive ventilation and invasive ventilation occur less frequently in patients undergoing noninvasive ventilation. What is noninvasive ventilation (NIV)? What is the historical background of noninvasive ventilation (NIV)? What is positive-pressure ventilation and how is it delivered? What are the types of noninvasive ventilation (NIV)? What is negative-pressure noninvasive ventilation (NIV) and how is it delivered? What are the advantages of positive-pressure noninvasive ventilation (NIV)? What is high-flow nasal cannula oxygen noninvasive ventilation (NIV)? In which patients is high-flow nasal cannula oxygen noninvasive ventilation (NIV) indicated? What is the basis of patient selection for noninvasive ventilation (NIV)? What are contraindications for noninvasive ventilation (NIV)? What other considerations may limit the use of noninvasive ventilation (NIV)? Which patients are best suited for noninvasive ventilation (NIV)? What are the patient inclusion criteria for noninvasive ventilation? Which conditions are most suitable for treatment with noninvasive ventilation? What are suitable clinical conditions for use of noninvasive ventilation (NIV)? With which clinical conditions should noninvasive ventilation (NIV) be used with caution? How does healthcare staff inexperience with noninvasive ventilation (NIV) affect outcomes? Where is noninvasive ventilation (NIV) utilized for inpatient care? How does noninvasive ventilation (NIV) differ from invasive ventilation? How should masks be fitted to ensure successful noninvasive ventilation (NIV)? What type of mask is most effective in noninvasive ventilation (NIV)? What are the advantages and disadvantages of an orofacial mask for noninvasive ventilation (NIV)? What are the advantages and disadvantages of a nasal mask for noninvasive ventilation (NIV)? What are alternative ventilator interfaces to orofacial or nasal masks for noninvasive ventilation (NIV)? What are the differences between critical care volume ventilators and specialty ventilators for noninvasive ventilation (NIV)? What are the modes of ventilation in noninvasive ventilation (NIV)? What are primary goals of noninvasive ventilation (NIV) and how should settings be adjusted to meet goals? What are initial inspiratory positive airway pressure (IPAP) or expiratory positive airway pressure (EPAP) settings in noninvasive ventilation (NIV)? What is the role of pressure control (PC) in noninvasive ventilation (NIV)? What is the role average volume assured pressure support (AVAPS) in noninvasive ventilation (NIV)? What are the benefits of average volume assured pressure support (AVAPS) in noninvasive ventilation (NIV)? Why are 1-2 hour trials of noninvasive ventilation (NIV) conducted? What are predictors of success in noninvasive ventilation (NIV)? What are late predictors of failure in noninvasive ventilation (NIV)? Why should trials of noninvasive ventilation (NIV) be limited? What is included in the objective criteria for discontinuation of noninvasive ventilation (NIV)? What are the major criteria for intubation of patients using noninvasive ventilation (NIV)? What are the minor criteria for intubation of patients using noninvasive ventilation (NIV)? What are guidelines for intubation? What is the role of noninvasive ventilation (NIV) in the treatment of chronic obstructive pulmonary disease (COPD)? What are the benefits of noninvasive ventilation (NIV) in patients with chronic obstructive pulmonary disease (COPD)? What are limitations to noninvasive ventilation (NIV) in patients with chronic obstructive pulmonary disease (COPD)? Which patients have a higher risk of failure with noninvasive ventilation (NIV) in chronic obstructive pulmonary disease (COPD)? How does noninvasive ventilation (NIV) affect the risk for nosocomial pneumonia in chronic obstructive pulmonary disease (COPD) patients? What is the efficacy of noninvasive ventilation (NIV) in the management of acute exacerbations of chronic obstructive pulmonary disease (COPD)? Which patients are most suitable for noninvasive ventilation (NIV) in chronic obstructive pulmonary disease (COPD)? What is the role of noninvasive ventilation (NIV) in the treatment of cardiogenic pulmonary edema and congestive heart failure (CHF)? What are the benefits of noninvasive ventilation (NIV) in the treatment of congestive heart failure (CHF)? What is the efficacy of noninvasive ventilation (NIV) using bilevel positive airway pressure (BiPAP) for cardiogenic pulmonary edema and congestive heart failure (CHF)? What are the intubation and mortality benefits of noninvasive ventilation (NIV) for congestive heart failure (CHF)? What is the efficacy of noninvasive ventilation (NIV) for congestive heart failure (CHF)? Which patients with cardiogenic pulmonary edema or congestive heart failure (CHF) may have the greatest benefit from noninvasive ventilation (NIV)? What is the role of noninvasive ventilation (NIV) after extubation? What are the benefits of postextubation noninvasive ventilation (NIV) support? Which patients are suitable for postextubation noninvasive ventilation (NIV) support? What is the efficacy of postextubation noninvasive ventilation (NIV) support? What is the role of high-flow nasal cannula oxygen therapy in postextubation noninvasive ventilation (NIV) support? Which patients are the best candidates for postextubation noninvasive ventilation (NIV) support? How can the role of noninvasive ventilation (NIV) after extubation be summarized? When is noninvasive ventilation (NIV) indicated? What is the role of noninvasive ventilation (NIV) in in the treatment of community-acquired pneumonia? What is the role of noninvasive ventilation (NIV) in the treatment of immunocompromised patients? What is the role of noninvasive ventilation (NIV) in the treatment of asthma? What is the role of noninvasive ventilation (NIV) in the treatment of postoperative patients? What is the role of noninvasive ventilation (NIV) in the treatment of rib fractures? What is the role of noninvasive ventilation (NIV) in the treatment of patients with do-not-intubate status? What is the role of noninvasive ventilation (NIV) in the treatment of acute respiratory distress syndrome (ARDS)? What is the role of noninvasive ventilation (NIV) in the treatment of severe acute respiratory distress syndrome? Which patients should be evaluated on a case-by-case basis before receiving noninvasive ventilation (NIV)? What are potential complications of noninvasive ventilation (NIV)? How are facial and nasal pressure injury and sores caused by noninvasive ventilation (NIV) managed? How is gastric distension caused by noninvasive ventilation (NIV) managed? How is dry mucous membranes and thick secretions caused by noninvasive ventilation (NIV) managed? How is aspiration of gastric contents caused by noninvasive ventilation (NIV) managed? What are complications of both noninvasive (NIV) and invasive ventilation? Which complications are avoided by noninvasive ventilation (NIV)? How do the utilization rates for noninvasive ventilation (NIV) vary among developed countries? What is the cost-analysis of noninvasive ventilation (NIV) use? Corrado A, Gorini M, Melej R, et al. Iron lung versus mask ventilation in acute exacerbation of COPD: a randomised crossover study. Intensive Care Med. 2009 Apr. 35(4):648-55. [Medline]. Parke RL, McGuinness SP. Pressures delivered by nasal high flow oxygen during all phases of the respiratory cycle. Respir Care. 2013 Oct. 58 (10):1621-4. [Medline]. Spoletini G, Alotaibi M, Blasi F, Hill NS. Heated Humidified High-Flow Nasal Oxygen in Adults: Mechanisms of Action and Clinical Implications. Chest. 2015 Jul. 148 (1):253-61. [Medline]. Ozsancak A, Sidhom S, Liesching TN, Howard W, Hill NS. EVALUATION OF THE TOTAL FACE MASKTM FOR NONINVASIVE VENTILATION TO TREAT ACUTE RESPIRATORY FAILURE. Chest. 2011 Feb 17. [Medline]. Wysocki M, Richard JC, Meshaka P. Noninvasive proportional assist ventilation compared with noninvasive pressure support ventilation in hypercapnic acute respiratory failure. Crit Care Med. 2002 Feb. 30 (2):323-9. [Medline]. Fernández-Vivas M, Caturla-Such J, González de la Rosa J, Acosta-Escribano J, Alvarez-Sánchez B, Cánovas-Robles J. Noninvasive pressure support versus proportional assist ventilation in acute respiratory failure. Intensive Care Med. 2003 Jul. 29 (7):1126-33. [Medline]. Briones Claudett KH, Briones Claudett M, Chung Sang Wong M, Nuques Martinez A, Soto Espinoza R, Montalvo M, et al. Noninvasive mechanical ventilation with average volume assured pressure support (AVAPS) in patients with chronic obstructive pulmonary disease and hypercapnic encephalopathy. BMC Pulm Med. 2013 Mar 12. 13:12. [Medline]. Pletsch-Assuncao R, Caleffi Pereira M, Ferreira JG, Cardenas LZ, de Albuquerque ALP, de Carvalho CRR, et al. Accuracy of Invasive and Noninvasive Parameters for Diagnosing Ventilatory Overassistance During Pressure Support Ventilation. Crit Care Med. 2017 Nov 20. [Medline]. Brochard L, Isabey D, Piquet J, et al. Reversal of acute exacerbations of chronic obstructive lung disease by inspiratory assistance with a face mask. N Engl J Med. 1990 Nov 29. 323(22):1523-30. [Medline]. Brochard L, Mancebo J, Wysocki M, et al. Noninvasive ventilation for acute exacerbations of chronic obstructive pulmonary disease. N Engl J Med. 1995 Sep 28. 333(13):817-22. [Medline]. Plant PK, Owen JL, Parrott S, Elliott MW. Cost effectiveness of ward based non-invasive ventilation for acute exacerbations of chronic obstructive pulmonary disease: economic analysis of randomised controlled trial. BMJ. 2003 May 3. 326(7396):956. [Medline]. Keenan SP, Sinuff T, Cook DJ, Hill NS. Which patients with acute exacerbation of chronic obstructive pulmonary disease benefit from noninvasive positive-pressure ventilation? A systematic review of the literature. Ann Intern Med. 2003 Jun 3. 138(11):861-70. [Medline]. Lightowler JV, Wedzicha JA, Elliott MW, Ram FS. Non-invasive positive pressure ventilation to treat respiratory failure resulting from exacerbations of chronic obstructive pulmonary disease: Cochrane systematic review and meta-analysis. BMJ. 2003 Jan 25. 326(7382):185. [Medline]. Confalonieri M, Garuti G, Cattaruzza MS, et al. A chart of failure risk for noninvasive ventilation in patients with COPD exacerbation. Eur Respir J. 2005 Feb. 25(2):348-55. [Medline]. Diaz GG, Alcaraz AC, Talavera JC, et al. Noninvasive positive-pressure ventilation to treat hypercapnic coma secondary to respiratory failure. Chest. 2005 Mar. 127(3):952-60. [Medline]. Scala R, Naldi M, Archinucci I, Coniglio G, Nava S. Noninvasive positive pressure ventilation in patients with acute exacerbations of COPD and varying levels of consciousness. Chest. 2005 Sep. 128(3):1657-66. [Medline]. Girou E, Brun-Buisson C, Taille S, Lemaire F, Brochard L. Secular trends in nosocomial infections and mortality associated with noninvasive ventilation in patients with exacerbation of COPD and pulmonary edema. JAMA. 2003 Dec 10. 290(22):2985-91. [Medline]. Girou E, Schortgen F, Delclaux C, et al. Association of noninvasive ventilation with nosocomial infections and survival in critically ill patients. JAMA. 2000 Nov 8. 284(18):2361-7. [Medline]. Lindenauer PK, Stefan MS, Shieh MS, Pekow PS, Rothberg MB, Hill NS. Outcomes associated with invasive and noninvasive ventilation among patients hospitalized with exacerbations of chronic obstructive pulmonary disease. JAMA Intern Med. 2014 Dec. 174 (12):1982-93. [Medline]. Stefan MS, Nathanson BH, Higgins TL, Steingrub JS, Lagu T, Rothberg MB, et al. Comparative Effectiveness of Noninvasive and Invasive Ventilation in Critically Ill Patients With Acute Exacerbation of Chronic Obstructive Pulmonary Disease. Crit Care Med. 2015 Jul. 43 (7):1386-94. [Medline]. Soo Hoo GW, Esquinas AM. Failure of Noninvasive Ventilation in Acute Exacerbations of Chronic Obstructive Pulmonary Disease: Need to Identify Borderline Patients. Crit Care Med. 2015 Nov. 43 (11):e530-1. [Medline]. [Guideline] Global Initiative for Chronic Obstructive Lung Disease (GOLD). Global strategy for the diagnosis, management, and prevention of chronic obstructive pulmonary disease. National Guideline Clearinghouse. 2016. Masip J, Roque M, Sanchez B, Fernandez R, Subirana M, Exposito JA. Noninvasive ventilation in acute cardiogenic pulmonary edema: systematic review and meta-analysis. JAMA. 2005 Dec 28. 294(24):3124-30. [Medline]. Iurilli CM, Brunetti ND, Di Corato PR, Salvemini G, Di Biase M, Ciccone MM, et al. Hyperacute Hemodynamic Effects of BiPAP Noninvasive Ventilation in Patients With Acute Heart Failure and Left Ventricular Systolic Dysfunction in Emergency Department. J Intensive Care Med. 2017 Jan 1. 885066617740849. [Medline]. Gray A, Goodacre S, Newby DE, Masson M, Sampson F, Nicholl J. Noninvasive ventilation in acute cardiogenic pulmonary edema. N Engl J Med. 2008 Jul 10. 359(2):142-51. [Medline]. Nouira S, Boukef R, Bouida W, et al. Non-invasive pressure support ventilation and CPAP in cardiogenic pulmonary edema: a multicenter randomized study in the emergency department. Intensive Care Med. 2011 Feb. 37(2):249-56. [Medline]. Burns KE, Adhikari NK, Keenan SP, Meade M. Use of non-invasive ventilation to wean critically ill adults off invasive ventilation: meta-analysis and systematic review. BMJ. 2009 May 21. 338:b1574. [Medline]. [Full Text]. Ferrer M, Sellares J, Valencia M, et al. Non-invasive ventilation after extubation in hypercapnic patients with chronic respiratory disorders: randomised controlled trial. Lancet. 2009 Aug 12. [Medline]. Esteban A, Frutos-Vivar F, Ferguson ND, et al. Noninvasive positive-pressure ventilation for respiratory failure after extubation. N Engl J Med. 2004 Jun 10. 350(24):2452-60. [Medline]. Maggiore SM, Idone FA, Vaschetto R, Festa R, Cataldo A, Antonicelli F, et al. Nasal high-flow versus Venturi mask oxygen therapy after extubation. Effects on oxygenation, comfort, and clinical outcome. Am J Respir Crit Care Med. 2014 Aug 1. 190 (3):282-8. [Medline]. Liu X, Xie Z, Teng H, Chen L, Zhang J. [Efficacy of noninvasive ventilation on treatment of ARDS caused by severe pneumonia after kidney transplantation]. Zhonghua Wei Zhong Bing Ji Jiu Yi Xue. 2017 Nov. 29 (11):994-998. [Medline]. Hong Y, Duan J, Bai L, Han X, Huang S, Guo S. Noninvasive ventilation failure in pneumonia patients ≥65years old: The role of cough strength. J Crit Care. 2017 Nov 4. 44:149-153. [Medline]. Kneidinger N, Gloeckl R, Schönheit-Kenn U, Milger K, Hitzl W, Behr J, et al. Impact of Nocturnal Noninvasive Ventilation on Pulmonary Rehabilitation in Patients with End-Stage Lung Disease Awaiting Lung Transplantation. Respiration. 2017 Nov 21. [Medline]. Neto MG, Gama Duarte LF, de Sousa Rodrigues-Jr E, Bittencourt HS, Gonçalves Dos Santos N, David BC, et al. Effects of noninvasive ventilation with bilevel positive airway pressure on exercise tolerance and dyspnea in heart failure patients. Hellenic J Cardiol. 2017 Nov 17. [Medline]. [Guideline] Mandell LA, Wunderink RG, Anzueto A, et al. Infectious Diseases Society of America/American Thoracic Society consensus guidelines on the management of community-acquired pneumonia in adults. Clin Infect Dis. 2007 Mar 1. 44 Suppl 2:S27-72. [Medline]. Antonelli M, Conti G, Bufi M, et al. Noninvasive ventilation for treatment of acute respiratory failure in patients undergoing solid organ transplantation: a randomized trial. JAMA. 2000 Jan 12. 283(2):235-41. [Medline]. Soroksky A, Stav D, Shpirer I. A pilot prospective, randomized, placebo-controlled trial of bilevel positive airway pressure in acute asthmatic attack. Chest. 2003 Apr. 123(4):1018-25. [Medline]. Squadrone V, Coha M, Cerutti E, et al. Continuous positive airway pressure for treatment of postoperative hypoxemia: a randomized controlled trial. JAMA. 2005 Feb 2. 293(5):589-95. [Medline]. Auriant I, Jallot A, Herve P, et al. Noninvasive ventilation reduces mortality in acute respiratory failure following lung resection. Am J Respir Crit Care Med. 2001 Oct 1. 164(7):1231-5. [Medline]. Ferreyra GP, Baussano I, Squadrone V, et al. Continuous positive airway pressure for treatment of respiratory complications after abdominal surgery: a systematic review and meta-analysis. Ann Surg. 2008 Apr. 247(4):617-26. [Medline]. Stéphan F, Barrucand B, Petit P, Rézaiguia-Delclaux S, Médard A, Delannoy B, et al. High-Flow Nasal Oxygen vs Noninvasive Positive Airway Pressure in Hypoxemic Patients After Cardiothoracic Surgery: A Randomized Clinical Trial. JAMA. 2015 Jun 16. 313 (23):2331-9. [Medline]. Hernandez G, Fernandez R, Lopez-Reina P, Cuena R, Pedrosa A, Ortiz R, et al. Noninvasive ventilation reduces intubation in chest trauma-related hypoxemia: a randomized clinical trial. Chest. 2010 Jan. 137(1):74-80. [Medline]. Levy M, Tanios MA, Nelson D, et al. Outcomes of patients with do-not-intubate orders treated with noninvasive ventilation. Crit Care Med. 2004 Oct. 32(10):2002-7. [Medline]. Cuomo A, Delmastro M, Ceriana P, et al. Noninvasive mechanical ventilation as a palliative treatment of acute respiratory failure in patients with end-stage solid cancer. Palliat Med. 2004 Oct. 18(7):602-10. [Medline]. Antonelli M, Conti G, Esquinas A, et al. A multiple-center survey on the use in clinical practice of noninvasive ventilation as a first-line intervention for acute respiratory distress syndrome. Crit Care Med. 2007 Jan. 35(1):18-25. [Medline]. Rocker GM, Mackenzie MG, Williams B, Logan PM. Noninvasive positive pressure ventilation: successful outcome in patients with acute lung injury/ARDS. Chest. 1999 Jan. 115(1):173-7. [Medline]. Frat JP, Thille AW, Mercat A, Girault C, Ragot S, Perbet S, et al. High-flow oxygen through nasal cannula in acute hypoxemic respiratory failure. N Engl J Med. 2015 Jun 4. 372 (23):2185-96. [Medline]. Patel BK, Wolfe KS, Pohlman AS, Hall JB, Kress JP. 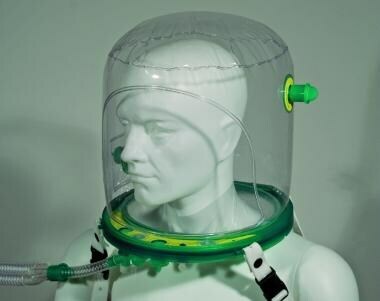 Effect of Noninvasive Ventilation Delivered by Helmet vs Face Mask on the Rate of Endotracheal Intubation in Patients With Acute Respiratory Distress Syndrome: A Randomized Clinical Trial. JAMA. 2016 Jun 14. 315 (22):2435-41. [Medline]. Benditt JO. Novel uses of noninvasive ventilation. Respir Care. 2009 Feb. 54(2):212-19; discussion 219-22. [Medline]. Cheung TM, Yam LY, So LK, et al. Effectiveness of noninvasive positive pressure ventilation in the treatment of acute respiratory failure in severe acute respiratory syndrome. Chest. 2004 Sep. 126(3):845-50. [Medline]. Moran F, Bradley JM, Piper AJ. Non-invasive ventilation for cystic fibrosis. Cochrane Database Syst Rev. 2009 Jan 21. CD002769. [Medline]. Shneerson JM, Simonds AK. Noninvasive ventilation for chest wall and neuromuscular disorders. Eur Respir J. 2002 Aug. 20(2):480-7. [Medline]. Wijdicks EF. Noninvasive mechanical ventilation in acute neurologic disorders. Rev Neurol Dis. 2005 Winter. 2(1):8-12. [Medline]. Antonelli M, Conti G, Rocco M, et al. Noninvasive positive-pressure ventilation vs. conventional oxygen supplementation in hypoxemic patients undergoing diagnostic bronchoscopy. Chest. 2002 Apr. 121(4):1149-54. [Medline]. Demoule A, Girou E, Richard JC, Taille S, Brochard L. Increased use of noninvasive ventilation in French intensive care units. Intensive Care Med. 2006 Nov. 32(11):1747-55. [Medline]. Maheshwari V, Paioli D, Rothaar R, Hill NS. Utilization of noninvasive ventilation in acute care hospitals: a regional survey. Chest. 2006 May. 129(5):1226-33. [Medline]. Soo Hoo GW, Santiago S, Williams AJ. Nasal mechanical ventilation for hypercapnic respiratory failure in chronic obstructive pulmonary disease: determinants of success and failure. Crit Care Med. 1994 Aug. 22(8):1253-61. [Medline]. Oro-nasal mask. Courtesy of Philips Healthcare (previously Respironics).